ConAgra Foods Inc has been sued by consumers who contend that hot dogs and other products sold under its Hebrew National brand are not kosher. The lawsuit alleges that meat processing services provided to ConAgra by privately held AER Services Inc fell short of the standards necessary to label Hebrew National products as kosher. As a result, they said, ConAgra misled consumers and was able to charge premium prices. Eleven individual consumers filed their complaint in May in Minnesota state court. ConAgra moved the case this month to a federal court in St. Paul. The lawsuit was reported last week by American Jewish World, a publication based in Minnesota. According to the complaint, Omaha, Nebraska-based ConAgra marks Hebrew National packages with a "Triangle K" symbol, and represents that the contents are kosher "as defined by the most stringent Jews who follow Orthodox Jewish law." But the plaintiffs said in the complaint that AER supervisors "did little or nothing" to address employee complaints that the meat processed for ConAgra was non-kosher. They also said Skokie, Illinois-based AER fired or threatened retaliation against those who complained. ConAgra spokeswoman Teresa Paulsen said in a statement on Monday: "While we can't comment on pending litigation, we stand behind the quality of Hebrew National and its kosher status." AER is not a defendant in the lawsuit. "The allegations in the complaint regarding AER are completely and utterly false," Shlomoh Ben-David, AER's president, said in a telephone interview. "There is no basis for them, and they are without any merit." ConAgra has long used the slogan "we answer to a higher authority" to promote Hebrew National products. The plaintiffs are seeking unspecified damages and an injunction against further mislabeling. Their lawsuit seeks class-action status for US purchasers of Hebrew National products over the last four years, and alleges negligence and violations of state consumer fraud laws. "This is an invisible fraud," Hart Robinovitch, a lawyer for the plaintiffs, said in a phone interview. "How does a consumer who thinks he is buying kosher meat really know he is buying kosher meat? It's a very, very difficult thing for a consumer to detect, unless someone investigates." Other ConAgra brands include Chef Boyardee, Healthy Choice, Peter Pan and Reddi-wip, and are not part of the lawsuit. 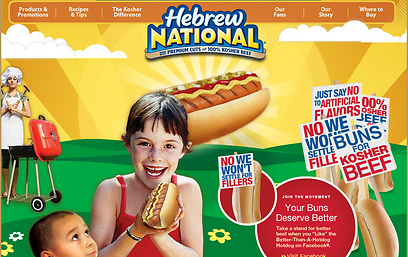 See all talkbacks "Hebrew National hot dogs not kosher, lawsuit claims"